Events are moving rapidly to establish the Great Lakes and the St. Lawrence Seaway as a carbon corridor for a newly aggressive North American energy industry. This poses the greatest threat yet to these waters. 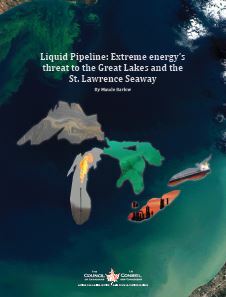 This report by Maude Barlow details plans to transport dangerous new forms of energy – as well as the waste from more traditional forms – around, under and on the Great Lakes and the St. Lawrence Seaway. It is also a call to action to stop these plans before it is too late. Ready to take action? Tell premiers and governors that it’s time to ban extreme energy on the Great Lakes. This entry was posted in Climate Change, News and Events by riverside11. Bookmark the permalink.